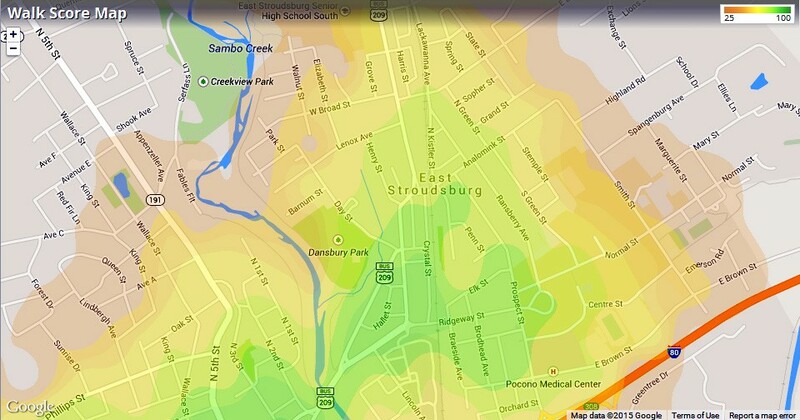 According to WalkScore.com East Stroudsburg is already 'Very Walkable'. Like most small towns, much of East Stroudsburg was built before the majority of the population owned cars. Being able to walk to where you needed to go was critical. Now that walkability is again in demand, the borough's history is the very thing that is making it so attractive. WalkScore.com analyses the number of nearby restaurants, shops, schools, parks, etc. It basically asks, "How many of these important features are within walking distance of a particular location?" It then assigns a Walk Score to that location. The higher the score, the more walkable the area. According to Walk Score, Downtown East Stroudsburg has a Walk Score of 78 out of 100, which the site rates as "Very Walkable" because "most errands can be accomplished on foot". On the map above, green areas are highly walkable, yellow areas, less so, and orange or grey areas require a car for most errands. For an interactive version of the map above, visit Walk Score's Philadelphia page, and pan north to East Stroudsburg. Walk Score does not analyze the safety of the walk, the quality (or even existence of) sidewalks, or the amount of vehicular traffic. But it does help compare the walking potential of one place over another. If you're looking for a highly walkable community, you should definitely consider downtown East Stroudsburg. Want to see more articles promoting walkability in East Stroudsburg? Please like our Facebook Page. Posted in Featured, Local on January 19, 2015 by wesadmin.